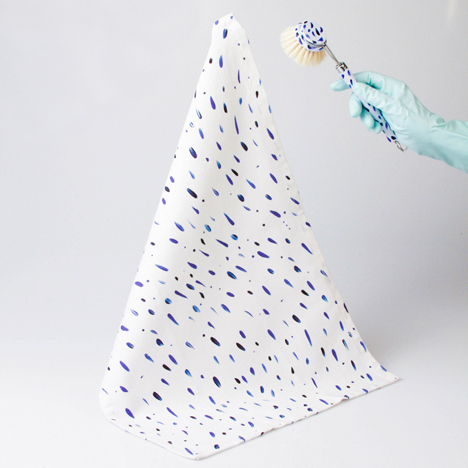 DesignMarch 2015: this textile range by Reykjavik designer Hanna Whitehead is covered with bright flecks and dots based on the coloured glazes from her ceramics collections. Whitehead studied at Design Academy Eindhoven before setting up Studio Hanna Whitehead in Reykjavik. She presented the 97 per cent cotton, 3 per cent linen fabrics as a range of speckled hand towels in an exhibition for the city's DesignMarch festival this week. The digitally printed patterns reference Whitehead's Past In Present ceramic collection, which she debuted at the festival last year. Also on display, these pieces are shaped like chiselled stone-age implements and are covered in brightly coloured glazes. "It originates from a previous ceramic project," explained Whitehead. "These are all shapes from the stone age which I put a pattern on to change the context." A set of pastel-coloured maracas that fit into the palm of the hand look similar to prehistoric flint knives, while small shallow trays reference jagged daggers. "I was wondering how could we use this shape today, it's such a great shape," Whitehead told Dezeen. "We don't know how to use it as a knife anymore and I was holding it and somehow it works with the hand – a hand tool." She experimented with bisque-firing that gave the pieces an unglazed finish that appeared "like something you would look at in a museum" before settling on the vibrant colour palette. "When you look at the shape, you don't recognise it anymore as being from the stone age, it becomes a new object," she added. Each towel is on display with its ceramic muse, as well as dish brushes with elongated handles painted in matching prints. Items from Whitehead's ceramic collections Past to Present and Dialogue, as well as a set of varnished sketches are also included in the exhibition. Sample books display fragments of knitted and sewn patterns, where Whitehead is experimenting with "knitting the glaze rather than always painting it". A long table in the centre of the space is dotted with jelly beans and a set of wooden tools with ceramic knobs. Whitehead invites guests to the exhibition to use the tools to rearrange the small sweets, which remind her of the glazing, and determine their own patterns. Whitehead has plans to expand the textile range and put into production by the end of 2015. DesignMarch continues until Sunday. Photography is by Hanna Whitehead and Skúli Júlíusson.